Marriages are made in heaven. This popular saying seems the title of some fairy tale when marriages fall apart on earth. It is somewhat true about NRI marriages due to increasing cases of fraudulence, dowry, domestic abuse, bride desertion, mental abandonment and social isolation. That’s why Indian government is approached to mandate Aadhaar Card for registration of NRI marriages in India. After the announcement of the launch of a dedicated portal for abused NRI brides in June 2017, the proposal to make Aadhaar compulsory for registration of NRI marriages in India is the next step for the Ministry of External Affairs to tackle abuse and abandonment of Indian brides abroad, according to an inter-ministerial committee. 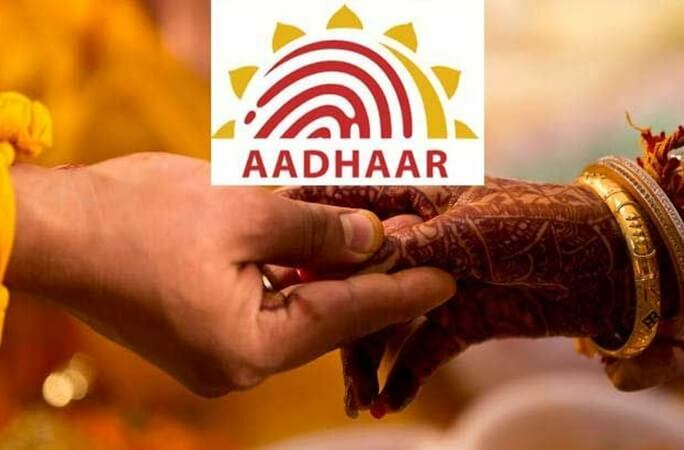 Initially, Aadhaar for registration of NRI marriages in India would be a must have only for those overseas Indians who hold an Indian passport, not everyone of Indian descent, according to the report submitted to the Ministry of External Affairs. Soon a policy for the Aadhaar registration of NRIs, Persons of Indian Origin (PIOs) and Overseas Citizens of India (OCIs) that the United Identification of India is working on will be introduced. It has also been proposed that the National Commission for Women (NCW) should be made the nodal authority to investigate disputed cases of NRI marriage. Apart from the proposal to mandate Aadhaar for NRI marriages, the committee has sought an amendment in India’s extradition treaties with other countries to hand over the custody of NRI grooms accused of domestic abuse and dowry harassment. The panel on NRI marriages, which was formed in 2016, has also proposed deputation of special teams comprising officials of the Ministry of External Affairs, the Home Ministry, and the Women and Child Development Ministry in the countries with a growing concentration of NRIs, such as USA, Canada, Australia and the UK. African and Gulf nations are also where India should depute the proposed special teams to track fraudulent or abusive NRI grooms. Why is Aadhaar for Registration of NRI Marriages Mandatory in India? 796 complaints about abusive, fraudulent, absconded NRI grooms were registered to the National Commission of Women from September 24, 2009 to November 30, 2011. About 25,000 brides from Punjab alone have been abused and abandoned by their NRI husbands over past few years, according to the Union Ministry for Overseas Indian Affairs. These days, most of the victims of domestic violence and mental abuse are Indian brides on H4 visas in USA. What makes Aadhaar for registration of NRIs marriages compulsory in India is a number of obstacles in tracing the whereabouts of fraudulent or abusive NRI grooms, which primarily because of incorrect overseas addresses. It makes the serving of court notices to the accused difficult. In several cases, NRI grooms have been found furnishing incorrect or fake details of employment, income, marital status, family, property, immigration status, and career prospects deliberately. If the Ministry of External Affairs makes Aadhaar a compulsory requirement for registration of NRI marriages in India, the difficulty in investigating such cases would be mitigated. In addition to the upcoming government portal for abused Indian brides overseas, Indian government has taken several measures to protect the rights of NRI brides, including a financial aid. Indian Eagle, a trusted travel partner of Indian Diaspora, publishes the latest news and stories in the interest of Indians worldwide apart from visa, immigration, Indian tourism and air travel news on its digital magazine, Travel Beats.